The Dopplo ladders are manufactured from aluminum and can be used in the following variants: propped or as double ladder (A type), bilaterally ascendable, with two hightensile safety straps. The steps have sturdy ascending rails made of rectangular, tubular aluminum. The steps are profiled, 80 mm deep for safe ascent and comfortable foothold, with multiple riveted, robust step/rail joints. The ladders are space-saving foldable (16 cm). 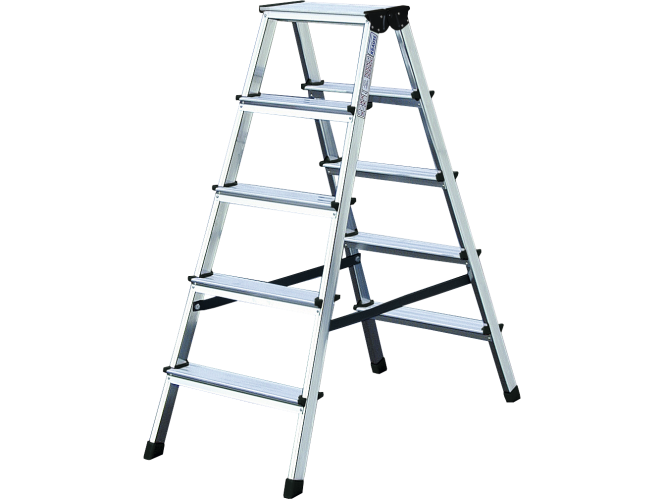 The ladders have non-slip foot caps that ensure foothold when standing.